The tasks collection is simply a collection of all the tasks in a project. It is the starting point for most Visual Basic programming exercises so it is important to know how to use it. The first thing is in how to set it. This is done using the Set keyword. 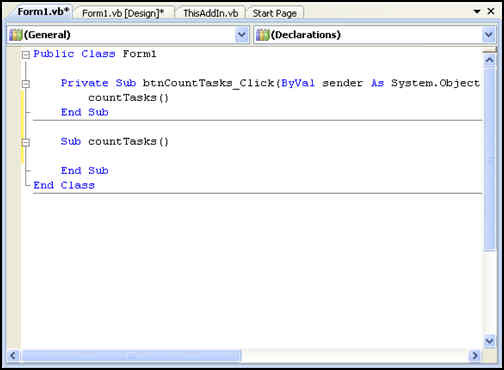 Typically one sets a collection to all the tasks in the project, but it is possible to set it to some other task collection. By putting your code in the middle of this structure (where it says "do something" you can be sure it will be applied to all the regular tasks in the project and won't generate an error when it hits a blank line. The Project object can refer to any project and you can define as many as you like. This can be useful when you want to compare a project which is open with another. msgbox "Task 5 is unchanged." There is another interesting type of Project and that is the SubProject. Subprojects are any projects inserted in a "Master" project. Sometimes it is necessary to go through them as well. An example is setting a particular view or modifying some information which can not be done in the "Master" view. The Projects collection has a small number of properties including count, parent and item. It also has a method to add a project. Project and SubProject have too many properties to describe here, but eventually I'll get around to covering some of the more interesting ones. Building a Project Server PDS Extension with dot net. 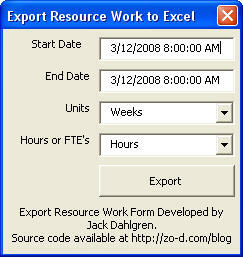 I used to have a link to the code for the "Export Timescaled Data to Excel" add-in, but I can't find it right now. Any of these links lead you to the MSDN documentation. I suggest you browse around the other topics while you are there. Many Microsoft Project users are not professional programmers so they might not be aware of some of the basics of visual basic. One of them which surprised me when I first ran across it was the "integer division" operator. Now most people know the typical add + , subtract -, multiply *, and divide / operators and what results they bring. But there are really two more which are quite useful in certain situations. The first is the integer division operator which is a backslash "\". Do not confuse this with the forward slash "/" which is used for regular division. The results of this operator are that division takes place as usual except any non-integer remainder is discarded. Here are a couple of examples to illustrate. As you can probably guess, integer division is a handy way of dividing and rounding down in a single step. Another related operator is the MOD operator. It is similar to integer division only it returns only the remainder. Here are a couple of examples. By putting them together you can break numbers into their component parts. Doing date math is an easy way to see how this works. Let's let "Days" be a number of days. We want to know how many weeks and how many days it is. The following formula would return how many weeks and how many days there are in that amount of time. Days\7 & " Weeks, " & Days MOD 7 & " Days"
This morning someone asked how to access code stored in another file. In this case it was the global.mpt file. There are a number of answers to this, but first I want to explain a bit about how code is stored within Project files. This is a bit complicated because there are a number of different places where the actual code can be stored. Don't fall asleep while I walk through this. The actual code is a procedure which is a named sequence of statements executed as a unit. procedures are commonly refered to as macros. They can come in a few varieties such as Function, Property, and Sub. They can be recognized because they typically start like Sub nameOfMyMacro() and end with End Sub or the same but using the Function or Property keyword. Procedures need to be stored somewhere. To make things manageable they are usually stored within something called a module. I tend to think of a module as an envelope which holds procedures. A module can contain one or more procedures. When you use the organizer you can only move code at the module level. The other place where procedures can be stored is in the project object. In the VBA object browser you can find it by opening the Project VBE (ALT+F11) then looking in the project explorer and expanding the project objects folder and then double-clicking on "ThisProject". I have an article with more details about "ThisProject" on my website if you want to learn more. It also describes a bit about class modules which I'm not going to go into here. There are 3 ways to refer to code in other project files. To make things clear lets assume that we want to run "macro1" which is in "module1" in "Project1" and that we are trying to do this from "Project2". If you want to use code from the global.MPT file simply substitute it for Project1. Save both projects and ensure that both projects are open. In VBE editor open Project explorer which lists all the projects. By default all vba projects are named as "vbaproject". The global.MPT file is named "ProjectGlobal". If you want to reference ProjectGlobal you don't need to do anything else. If you want to reference another project you will need to change the name to make it unique. To do this select the vbaproject corresponding to project1.mpp, click on properties icon, change the vba project name to vbaproject1. Do the same to project2 but call it vbaproject2. References are automatically opened if available. You can not use this method to call a project macro from some other application like vb6, Excel etc. You will get an error if Project1 is renamed, deleted or moved. This is my method of choice when the module is in the global.MPT file. You can use this method to call project macro from some other application like vb6, Excel etc. In this case Macro1 must be in ThisProject module or any class module (to be clear ThisProject IS a special case of a class module. It is not a standard module). To summarize. I prefer the first method, but the other two are valid alternatives, though the third is a bit fussy. Thanks to Venkata Krishna for pointing these three methods out to me many years ago. Microsoft Project is a tool that many managers use behind closed doors to prepare massive, wall-sized works of fiction for the entertainment of corporate executives. Closely read, these fictional plans prove convincingly that neither gravity nor even the speed of light are obstacles for the corporation's mighty horde of otherwise unruly developers. What this macro does is prompt the user for a key which is used with the XOR operator to encrypt the data. You can read more about how this works here. If you like, you can expand on this and use a more sophisticated algorithm, but this should stop most casual readers from decrypting your data unless they have read this article. The problem with this approach is that the algorithm used for encryption is exposed whenever anyone hits ALT+F11 and views the macro code. You can avoid this by keeping the code in your global.mpt file. However, that would prevent any others from being able to encrypt the data. So we need to take a second step and protect the macro code itself. 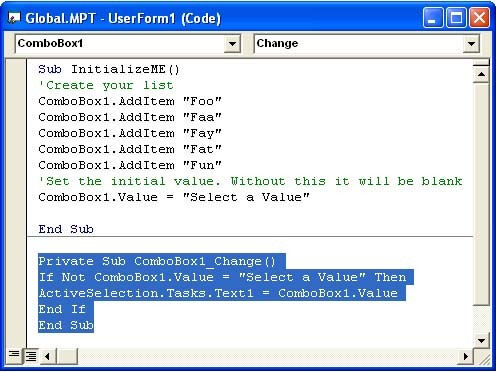 From the VBA editor, right-click on the module where the code is located. On the Protection tab, check the Lock Project For Viewing check box. Enter a password and verify it in the boxes at the bottom of the tab. Now your code is protected. I should warn you that even this is not secure. It is possible to break the password that you have used to protect the macro and with knowledge of the algorithm you used it may be possible for someone to break the password which you have used to encrypt the data, so if something is really secret don't even bother to do this, just keep the file locked somewhere secure and don't share it. But for casual users this should be sufficient to keep them from snooping around. 'be displayed in a usage view or in a report. The line t.Text5 = t.Text5 & ", " & a.Text5 appends whatever is in the assignment field to whatever is already existing in the task field. Some simple modifications can make it work to copy from the resource fields. 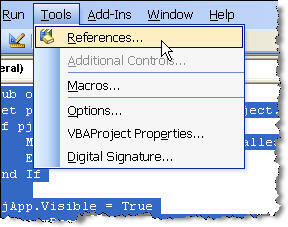 One of the easiest ways to learn how to use Microsoft Project VBA is to use the macro recorder. It does not always produce reusable output, but it does output the correct syntax and it identifies the objects, properties and methods which are involved in what you want to do. Let's work through a simple example like zooming the timescale to show only the selected tasks. Start with turning on the macro recorder by going to the tools menu / select "macros" / select "record new macro". Give it a title and note where it is going to be saved. Now select some tasks in your project. Then go to the "view" menu / select "zoom" / select "selected tasks" and click OK. Now we turn off the macro recorder either by going back to the tools menu and choosing "stop recorder".
' Macro Recorded 8/29/05 by yourusername. This code is OK, but it is not reusable because each time you run it, it will select two rows which are 6 rows above where ever your cursor is. Chances are you don't want that. So we edit it and remove that row. This code works fine, IF you have a valid selection. Try running it on a blank row and you get an error. So we need to make one more modification to it. Now if we have a task or tasks selected this code will zoom the view to show the entire duration of the longest task. An obvious next step is to assign this to a toolbar button so you can zoom the selection with a single click. A more complicated example is exporting a file to excel. I can never remember the exact syntax off the top of my head, but turning on the macro recorder and exporting makes it easy. Here is the code I get while creating a map and saving a file. Note: for formatting reasons I've added several line continuation characters "_" so that the long lines will fit on the screen correctly. You can see that the macro recorder makes this a lot easier than typing this in from scratch. If you are interested in Project VBA you can now find a chapter I wrote on Project VBA for Que Publishing online here. It goes through the basics of working with the visual basic editor, debugging, and gives several code examples. I'm a bit surprised to find it free on the internet from the publisher so go get it while it is still there. "When you have code with a large number of steps and you know only the initial state and the outcome, it is difficult to figure out where the root of your problem lies. The VBE provides the ability to view your code as it executes and to check the values of your variables. The main tools to do this are breakpoints, watches, and the Immediate window. Microsoft Project files have a couple of different types of properties. The first are the "BuiltinDocumentProperties" which Project inherits from the Office Suite (Word, Excel, Access ...). These properties describe things like author, title, subject, creation date and the like. The second are the CustomDocumentProperties which are specific to Project. You can also create your own custom properties as well. The custom properties can be used to report cost, duration, start and finish dates of the project and a multitude of other interesting items. One problem that this causes is that it can sometimes be difficult to know what properties are being used in a specific file. To report them out and to give a simple example of writing to a text file I put together a macro which loops through all of them and writes them to a file. Even if you are not interested in the project properties this example illustrates some of the more commonly required programming techniques. I'll walk through the code with some comments and then offer the whole thing at the end if you want to cut and paste. Declaring the variables is optional in Project VBA, but it can help prevent some problems later. If a variable isn't defined then Project treats it as a "variant" which it needs to allocate more memory for. Project also makes some assumptions about how to treat a variant in different circumstances. In most cases it assumes correctly, but there is always the chance that it may make the wrong assumption so it is good practice to be explicit about your variables. Following this we set the initial values for some of the variables. The next step is to set up a file to write to. The next bit of code sets the file name and then uses the FreeFile() method to create a file. We open the file to write to it. We choose to open the file "for output". This allows us to write to it. The other possible modes are "for input" which would allow us to read data from the file and "for append" which appends data to the file. This last mode is useful for logs. MyFile = "c:\" & ActiveProject.Name & "_properties.txt"
Once we have created and opened the file we can write to it. In the "for output mode we do this with a "Write" statement. First we write a line as a header and then a blank line. Each "write" statement creates a new line. The comma is required. Write #fnum, "Built In Properties"
Now we use a "For...Next" loop to go through all the properties. Because there are some gaps in the numbering of the properties, the macro would fail when it hits gaps in the sequence. We solve this by putting in an error handler. When the code errors then it goes to the code which we want to execute "On Error"
You can see that each loop through will write the property number, the name and the value of the property. You may be wondering why the if...then" statement is there. I include it because of the way the errors are handled. Our error code is very simple. It just resumes on the next statement. Since the next statement writes a line to the file it would result in re-writing the previous property again, so we add a line to the error handler which sets skipMe to true and then we do not write the property. From here the code for the custom document properties is the same. We need to close the file after this. And finally we have the code to handle errors and end the procedure. 'to a text file. It lists the index of the property, the name and the value. 'occur when a property is not defined or used. MyFile = "c:\" & ActiveProject.Name & "_2properties.txt"
I've mentioned before that when looping through a collection of tasks in Project that there are a couple of holes you can fall in. This note gives an example of another problem you might run into and describes how to combine tests. The first problem is encountering a blank line. Many people insert blank lines in their project files to make the table easier to read, however when project references a task which is blank it will give an error. The easy way to do this is to test for it with an if .. then statement. You would simply add a test to see if the task really exists. Another thing you might want to do is to eliminate external tasks. These are a sort of "ghost" task and don't have all of the information or properties of a real task. They merely point to the project file which has the real task. We can filter them in a similar way. Now, you might think, "Why do I need two if statements? Can't I combine them? , but you can't. 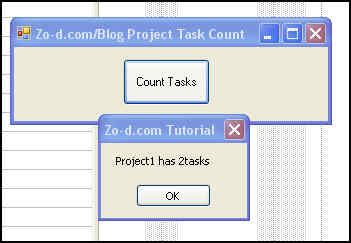 If the task is a blank task, then it will cause an error when it is checking the second condition. Blank tasks do not have the .ExternalTask property so the check for blank tasks always must come first on its own line. You CAN combine checks for summary tasks on the same line as for external tasks. This is commonly done when you are summing values from tasks. Since the summary task often has the sum of the tasks below it, summing and including it will give you an incorrect answer. Combining the two conditions with a booleanOR will do the trick. "The tech equivalent of The Beach Boys"
It dovetails nicely with Glen's latest post on evidence. When am I ever going to write anything thoughtful again? All I can say is that C# is slightly less than elegant in the way it handles optional parameters. Just a bit awkward, wouldn't you say? Yes, along with multiple undo, the ability to format cells with a background color and pattern will be here in Project 2007 which has an expected release date sometime in early 2007. The Beta2 release was yesterday and a new SDK was released (find it here). New for Cell object. Background color of the cell. In Project 2003 as GroupCriterion property only. New for Cell object. Foreground color of the cell font. In Project 2003 as GroupCriterion property only. New for Cell object. Background pattern of the cell. In Project 2003 as GroupCriterion property only. Changed: added parameters CellColor and Pattern. Rod Gill has put out a new book which covers most of what you need for Microsoft Project VBA programming. As far as I know it is the only book about VBA that I know of. The last edition of Tim Pyron's "Using Microsoft Project" was so full that the VBA chapters were moved to an addendum on the web so it is great to see a book dedicated to just VBA. The book moves from the most basic concepts through creating some useful macros and userforms. It even offers an updated version of something very similar to my "Trace" macro. At the end of each chapter there are some example questions/problems which would make this book very useful if you are teaching VBA in a class. In the US the book was localized by Gary Chefetz and Dale Howard of MSProjectExperts and if you are familiar with their Project Server books you will be happy to see that the same high quality is embodied here. Highly recommended for anyone who wants a solid grounding in Microsoft Project VBA. Here is a link to the book at Amazon. Disclaimer: I know these guys and have had dinner with them at least once. The first thing to do is to create a form. Going to the Visual Basic editor, you would choose "Insert / UserForm". This creates a blank userform and should display the toolbox. Drag a combo box from the toolbox onto the form. It will be called "ComboBox1" if it is the first one. You can rename it using properties (and you should) but for this example we are not. ComboBox1.Value = "Select a Value"
Next you need some code to start the form. To keep this example pathetically simple we will only do two things here, initialize the combo box values and then show the form. You could do it the other way around, but better to have the form ready to go when the user first sees the form. You can run the code now. Go to tools macros and select the ShowTheUserFormAlreadyPlease macro. The form should display and have a working combo box. Of course it does NOTHING right now. So the next thing is to look at the methods of the combo box and see what it can do. If you look at the top of the code window you see on the left a box which says "ComboBox1". This selects an object to work on. On the right is a box which says "Change". This is a list of procedures associated with that object. The only trick in there is the if then statement so that the text1 value does not change when you are setting the value of the combo box when it first displays. The code that you can put in the procedure again is only limited by what you can imagine. It could be extensive and create and initialize a new project with default values etc. As much as you are capable of. Warning: I have not shown any error handling here. If you had no tasks selected you would have gotten an error or if there was no project open or ... so be careful and write procedures to handle that. And always test against whatever scenarios you can imagine. myString = " There is space in front and in back "
to return "There is space in front and in back"
The problem was that converting a Microsoft Project Unique ID to a string adds a leading space to the string (why? I don't know, but it does) so you can use trim to obtain just the characters you want. Trim is not just a VBA function, you can use it in Excel formulas, MS Project custom field formulas and just about any programming language I've seen. I've used it extensively with spreadsheets that contain data pasted in from other sources. There are a few other pieces of the puzzle to clarify. Open for has a number of mode parameters. You can open for input (read only), output (write only), append (write at end - good for logs), binary and random (read/write default). You can also control this by an optional access keyword (read, write, read write) but why bother if you have the mode set. 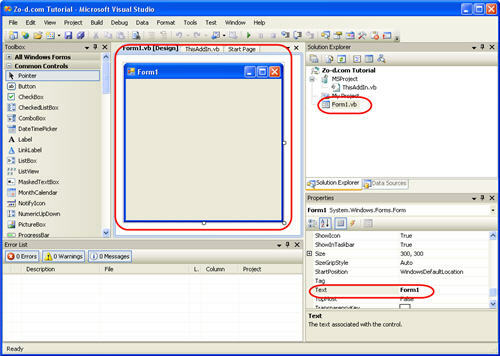 Freefile is used to get the filenumber of the next free file. Bill Gates has been quoted as saying robots are the next frontier (or something like that). The Instr function is used to find out if one set of characters (string) is contained in another. It can be used in VBA macros (in Word, Excel, Project etc.) and also in Microsoft Project and Microsoft Project Server Custom Field Formulas. In Project this can be used to find out if a task name contains some special coding. For example perhaps you have used a special naming convention to separate time tracking tasks from other tasks and you need to roll them up separately. By using Instr you don't need to have the coding in a specific position. You can put it at the beginning, middle or end of the name and Instr will still find it. Instr is also useful in string manipulation because it returns the position of the first occurrence of a string in another string. Using it in conjuntion with the left function you can strip out leading characters. start is optional. The default is to start at the first character, but if you want to skip the first character then you can set it to another value. This could be useful for looking for the second occurance of the string you are looking for. You could feed in the result + 1 of another instr function to see if the string occurs again. Using this recursively you could count specific characters. string_to_search_in is the string that will be searched. string_to_search_for is the string to search for. compare is optional. By default it does a text compare so most likely you can leave it out. The valid choices are: vbBinaryCompare, vbTextCompare and vbDatabaseCompare. I'm not even sure what vbDatabaseCompare is so don't worry about setting compare unless you are doing something a bit more advanced. InStr(1, "This is a time tracking task", "tracking") would return 16. InStr("This is a time tracking task", "is") would return 3. InStr(10, "This is a time tracking task", "t") would return 11. InStr("This is a time tracking task", "abalone") would return 0. The "Analyze Timescaled Data In Excel" add-in which ships with Microsoft Project has a couple of limitations, the first is that it is not easy to find, and the second is that it is task-based only, so if you want to export resource data you are out of luck. In this post I'll show how to write your own code to export resource timescaled data and use what you have learned to export almost any sort of timescaled data you can think of. Project is different from other applications like Excel because it has a dimension of time. Tasks have values for work and cost, but also contain the time dimension in the form of duration. On a specific task, the amount of work or cost may vary during the task instead of being spread evenly across the task. Because of this users sometimes need to view this information by day or week or hours. Within project they do this using the task usage view or the resource usage view and setting the timescale the way they want to see it. But sometimes they want this data outside of project and when they try and cut and paste, they find that it is not a simple matter. The view can not simply be copied and pasted. So to do this you need help from VBA. Underneath the surface of project is a powerful programming language called Visual Basic for Applications (VBA). It can be used to do just about everything that you can do manually in Microsoft Project but it can also do things which would be quite tedious or difficult to do manually. This example presumes you know have some understanding of VBA and if you don't I suggest you read the articles I've posted here (link to programming archive). 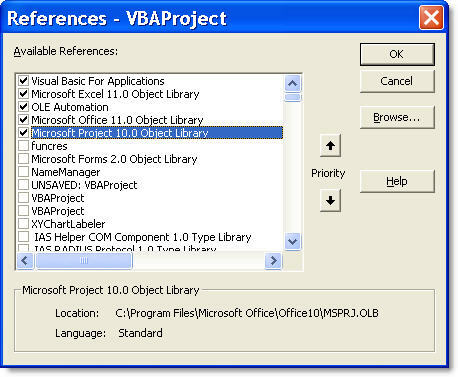 VBA can open and operate other Microsoft Office applications. In this case we will open Excel and write data into it. The TimeScaleData method is used to get a collection of timescaled values from tasks, assignments or resources which you can iterate through or read. The syntax for TimeScaleData method is a bit complex so it needs some explanation before we get into writing our code. An Assignment or Assignments Collection, A Resource or Resources Collection, A Task or Tasks Collection. StartDate is the start date for the data. The twist here is that if the date you provide falls within an interval you are requesting, the StartDate is rounded to the start of that interval. For example if you are using TimeScaleUnits of months and enter a date in the middle of the month, StartDate will "round down" to the start of the first day of the month. FinishDate is the finish date for the data. Like StartDate it rounds, but in this case to the end of the time interval you are using. Count is the final parameter. It controls how many timescale units are grouped together. Use it if you want to group the data by a timescale which is different than the ones available. For example if you wanted your data by half years, you could set TimeScaleUnit to pjTimescaleMonths and use a Count of 6. The TimeScaledData method returns a TimeScaleValues collection. This is a collection which contains all of the timeslices and their values. We use the TimeScaleData method on an object and use the resulting TimeScaleValues as the source of our data. Our Export form is built around this method. The key operation is: Set TSV = r.TimeScaleData(tbStart.Value, tbEnd.Value, TimescaleUnit:=cboxTSUnits.Value, 1) Now all we need to do is build a form which will supply the correct parameters and which will export the data to Excel. Many of the examples on this site or my other site (link to masamiki.com) don't ask the user for much information, but the TimeScaleData method has a number of parameters that must be supplied. And some of those parameters are selected from a list. Because of this we need to move from the simple input box to a form. A form can have a number of different controls on it. This example is kept very simple. It has Start Date and End Date text boxes. Units and Hours or FTE combo boxes and a button which will run the code to export the data. A more fully developed version could have selections for Resource, Assignment or Task and could also have a list of all possible data types. Behind the form there are a number of subroutines. The first one runs when the form is first shown. To keep this readable I've left out all error handling and the like. It is meant as an example of how to use the TimeScaleData method and read from the TimeScaleValues collection. If you hadn't noticed, the code which runs when the button is clicked contains only one command. It is possible to put the whole exportResourceUsage subroutine code under the handler for that button, but by putting it in a separate subroutine, it is easier to reuse the subroutine and keep the code readable. Now, we have the form and the code (rightclick here to save a copy of the form to your computer). The next step is getting the form to display. To do this we need to write a single line of code. This macro can then be assigned to a button on your toolbar. Clicking the button runs the macro which shows the form. There are a large range of TimeScaleData types available and which can be used to produce everything from Earned Value S-charts to cashflows or resource availability. The types possible depend on whether you are looking at Assignment, Resource or Task data. For example, Percent Complete is only available when looking at a task or task collection. WorkAvailability is only relevant to resources. The constants to specify the Type always follow the same format, beginning with "pj" then the type of object you are referencing (Task, Resource or Assignment), then "Timescaled" and finally the data you are looking for. For example you would use pjTaskTimescaledDataActualCost for actual cost for a task, but pjResourceTimescaledDataActualCost for costs of a specific resource. The Form which contains this code can be found here: ExportTimescaledData.zip. Unzip and then open project, hit ALT+F11 to open the visual basic editor. From the file menu in the editor select "Import File" and browse to the file. Don't forget to write a macro to make the form show like I explained earlier. It is useful to have that macro assigned to a button on the toolbar. The Mac BU also announced it is bringing VBA-language support back to the next version of Office for Mac. Sharing information with customers as early as possible continues to be a priority for the Mac BU to allow customers to plan for their software needs.Although the Mac BU increased support in Office 2008 with alternate scripting tools such as Automator and AppleScript -- and also worked with MacTech Magazine to create a reference guide, available at http://www.mactech.com/vba-transition-guide -- the team recognizes that VBA-language support is important to a select group of customers who rely on sharing macros across platforms. The Mac BU is always working to meet customers' needs and already is hard at work on the next version of Office for Mac. One of the most useful features of Microsoft Project is the ability to automate actions with it. Primarily this is done by writing VBA (Visual Basic for Applications) code, or by just recording a macro and then editing the VBA code that the macro recorder produces. 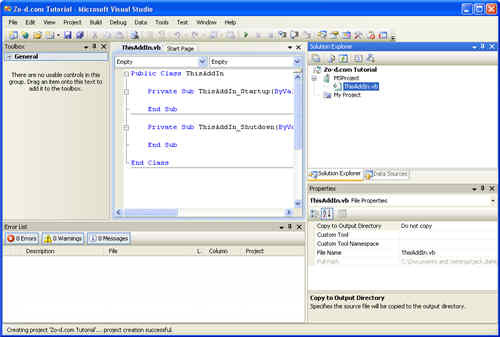 But a few years back Microsoft came out with VSTO (Visual Studio Tools for Office) which allow you to more easily write code to automate office applications within Visual Studio which is their main line programming environment. For a long time I ignored VSTO because it didn't live up to the promise it made. It was clumsy to use and difficult to deploy the applications. I also avoided it because I couldn't get the project add-in templates to work. 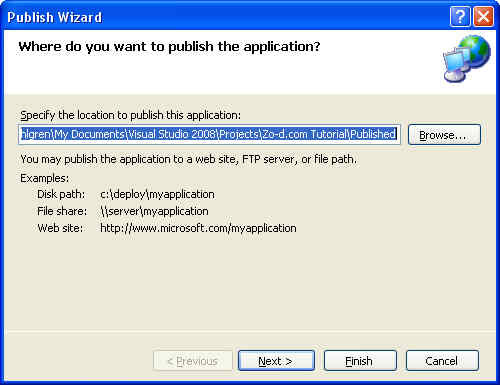 This tutorial assumes you have Microsoft Visual Studio 2008 installed. The first step is to open Visual studio and from the "File" menu, select "New Project...". This brings up the "New Project" dialog box. In this case I'm using Visual Basic as the language as it is closest to VBA so it is easier for me to deal with. 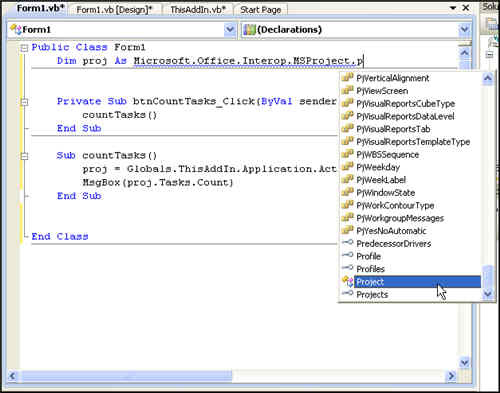 Expand the "Project Type" tree on the left to find "Visual Basic/Office/2007" then enter a name for your solution. If you do not enter a descriptive name now you will regret it later. 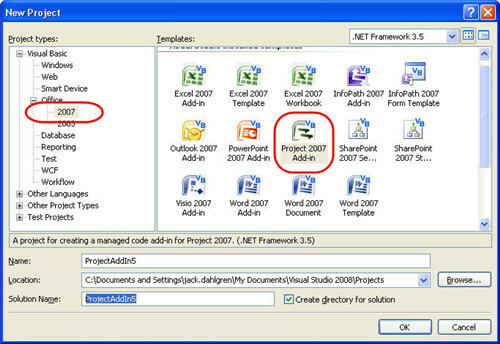 Highlight "Project 2007 Add-in" and click "OK". The solution will be displayed with two subroutines, one which occurs when the add-in opens and the other when it closes. In most cases you want the user to be able to do something. That means we need to provide some sort of user interface. In this simple case we are just going to display a user form. To add a form go to the "Project" menu and select "Add Windows Form..."
In the dialog box that appears you can see all of the other types of objects you can add to your project. Things like the splash screen allow you easily build some commonly used user interface elements. But for now, we need just one form. Once you have added the form you will see the form itself in the design window in the center of the screen. You should also see it in the "Solution Explorer" on the upper right side of the screen. The design window is tabbed so you can see the original thisaddin.vb code tab behind the current "Form1.vb" tab. The new form is just like a user form in Project VBA. You can edit the Text property to give it a new name in the title bar. Set it however you would like. There are a number of different properties which you can set for font, color, size, behavior etc. Try playing around with some of them. There is one property we really want to set for this form, topmost property should be set to True so that the form always stays visible on top of the application. Now that we have the form we want to put some controls on it. For those who aren't familiar with using forms, a control is typically just something on the form - a label perhaps or a button, textbox or perhaps something more complex like a date picker. The next screenshot shows the common controls in the toolbox. There are many other controls available as well. 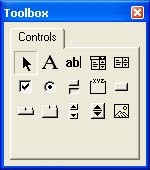 One of the biggest advantage of using an Add-in rather than a VBA user form is that there are a much wider variety of controls available. 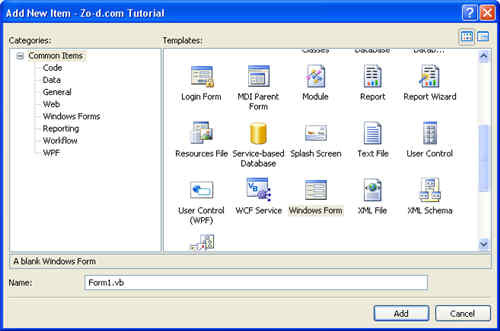 The Windows forms also offer standard things like the ability to easily resize the form. To keep this example really simple I am just going to add one button and one label. Clicking on the button will count the tasks in the active project and then put that value in the label. To do this we just select the button control in the toolbox. When it is selected the cursor will change as shown below. Then just click and drag anywhere on the form to create the size and shape of button you want. The button will be created with a name like "Button1". If you are going to change the name of the button, this is the best time to do it. Make sure the button is selected and then in the "Properties" box at the lower right side of the screen find the "Name" property at the top of the list. Edit it to whatever you like. I usually name the button with the action that they are going to perform. This one I call "btnCountTasks". When you have renamed the button, you will notice that the text on the button has not changed. It still reads "Button1". Scroll a bit further down the list of properties and set the "Text" property to "Count Tasks". You can look at some of the other properties while you are there, but to keep things simple don't change any of the other properties. The next step is to write some code so that clicking on the button actually does something. 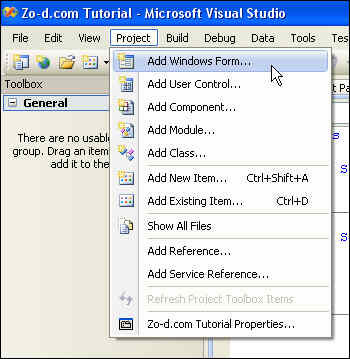 Double Click on the button and Visual Studio will automatically switch to the code view for the form. It will also automatically create a handler which will run whenever you click the button. If you want to create a handler for a different event, select the appropriate event from the drop down list of events at the right top corner of the window. If the event exists it will be shown in bold and selecting it will take you to that section of code. If it doesn't exist, then the shell of the handler will be created for you. When the event handler is created the cursor is sitting there waiting for you to type code. At this point you could simply start writing code, but to make things easier and more modular, I prefer to have a button click call a sub-routine. That way another button can call the same sub-routine. It also makes writing and debugging the code easier. So the only thing we are going to do is call the sub-routine I'll call "countTasks". To do this, select a line outside of the event handler and type "sub countTasks()". The editor will create an end for it and a blank line for your code. Now go back to the event handler and on the blank line there write "countTasks". You now have a button which when clicked will run the countTasks sub-routine. There are several options for publishing the add-in. That subject is also worth a separate post detailing all the different ways, but for now I'm just going to publish to a folder on my own hard drive. To do this go to the "Build" menu and select "Publish ..."
When the wizard runs, enter the location you want to publish to and click your way through the rest of the wizard. It might take a little while and when you are done you will see a notification in the lower left corner that "Publish succeeded". Using Windows Explorer, navigate to the location that you saved the file to and double-click the "Set-up" file. After installing, the add-in will run whenever you open project. This add-in will float above your project and can be clicked at any time. If you want to close it, just click the x. If you want to disable it, go to the "Tools" menu, select "Com add-ins" and then deselect the item from the list that shows. You can also remove the Add-in by going to your Windows control panel, choosing the "Add-Remove Programs" option, find the add-in and click on "uninstall". I hope that you found this tutorial helpful in understanding the basic principles of building and deploying a VSTO Microsoft Project Add-in. With a bit of work you can take this very rough and simplistic Add-in and create something useful and easy to deploy. Feel free to leave comments or ask questions. UPDATE: Find the second part of this tutorial which shows how to add a command bar and command buttons here. This installment covers how to add a command bar and a couple of buttons. If you have not read the first tutorial you should go back and read it here. The first thing to do is to define the objects we are going to use. 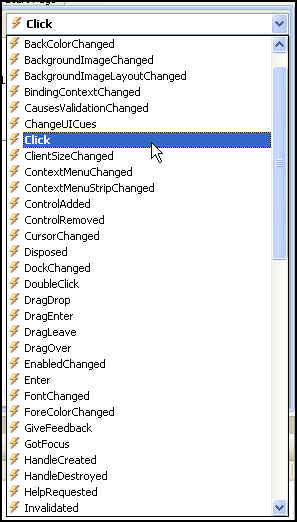 We want them available from any other object in our add-in so define them right at the top. The command bar is going to use two buttons only. One will display a form with buttons and other controls. The other will display a form with "About" information on it. The next thing to do is to add the command bar. I've put this in its own subprocedure so tha I can easily reuse the code in another add-in or if I want to add multiple command bars to the same add-in. It takes a string barName as the name of the bar. This code should be really simple, but we want to make sure that we have the latest version of the command bar so first we check to see if the bar exists. If it does then we delete it and add it again. The next step is to add the buttons to the toolbar. Once again I'm writing this as a subprocedure so that I can easily reuse it or modify it. The names of the buttons are hardcoded but you could add them as a parameter as well if you feel like it.
' Add a button to the command bar and create an event handler.
' Add a second button to the command bar and create an event handler. If we run these two subprocedures we get a tool bar and add two buttons to it. Next we need to set up what the buttons should do. Similar to any button control, we use an event handler (defined above). The first button will create and show our master form. We do a similar thing for the "About" form. The next thing to do is to make sure that these subprocedures run when the add-in starts. We put the two subprocedures in the "Startup" event for the addin. The very final thing to do is clean up after ourselves. If a user wants to remove or unload the add-in we would expect that the command bar would go away as well. To do this we just delete the command bar in the Shutdown event for the Add-in. 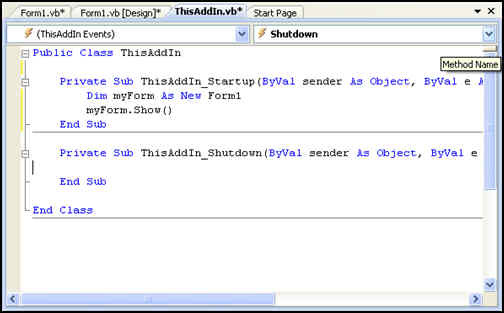 With this and the previous tutorial you should be able to get through the initial hurdles that you face moving from VBA to VSTO and should be able to create and deploy a Project 2007 Add-in that adds a command bar and displays a form. And you should be able to create a form with some simple controls and code. From this point on, coding in visual basic using Visual Studio 2008 is very similar to using VBA. Most of the Microsoft Project or Excel macros I write include looping through a collection of tasks or resources or assignments and use the a For Each ... Next loop, but that doesn't mean we should neglect the For ... to ...Next statement. The next part is the start parameter. This is often just an integer like 0 or 1, but you can pass any numeric vaue to it. End is similar, but it is more likely to be a variable something like ActiveProject.Tasks.Count or UBound(myArray()) work nicely. The value of the counter i can even be set within the statement, but be aware that this can cause problems. It is certainly possible to create an endless loop this way. It can also be more difficult to debug. Do it only if you have to. 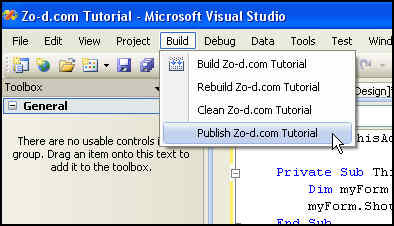 One of the new features of Project 2007 is that it allows more than one level of Undo. This is of great comfort to those of us who have made more than one error while working on a file. It also has a benefit for those who automate microsoft project with VBA or VSTO as typically there are many things done during the execution of a macro. In Project 2003 this often meant that macros were irreversible unless you somehow built your own log of the changes and then went back through it to restore things to their prior state. Then when you click on the undo button, all of the changes within that transaction will be reversed in a single click. This is very valuable when you are making a very large number of changes - for example if you modified all of tasks in your macro. You would then look through the list of transactions until you find the one with the name you like and then reverse that many transactions. It would be great if you could undo out of order, but I have not found any way of doing that. Just like a stack of cards, you have to take the top one off in order to get to the ones underneath. There are a few things to be careful about undo. First, be aware of the number of undos. Once a transition drops off the bottom of the list it is gone. Second, a project save will clear the undo list. Third, large numbers of undo may affect performance as all that information needs to be held temporarily. Check it with some samples to see the effects in your environment with the types of changes you are going to make. Master Projects in Microsoft Project don't always behave the way you expect, especially if you are trying to iterate through all the tasks in them. The reason is that the file doesn't really contain the subprojects, it merely acts as a shell to display them. So if you are writing some code which has to work on a master project you need to take this into account. The simplest explanation is an example. The code below will start with a master project, then find the list of subprojects, open each one in turn and display a message box with the project name. You can of course do whatever you want with the subproject as soon as you have it open. A couple of things to note here. First, I'm using the mProj and sProj variables to reference the different projects I have open. We want to return to the master project at the end so I set mProj equal to the ActiveProject when we start and then return to it by calling mProj Activate at the end. The second thing is that the subproject object only has a few properties. It is a reference to a project and not a project itself. We use the Path of the subproject to open the file that it is referring to and then use sProj to refer to that file once it is open. Just to be sure you get the point, subprojects point to the file, we are using a project variable to refer to that file when it is opened. You can't get typical project properties (not even Name) from subprojects. You only use the subproject object to get to the project. It goes without saying that this is a trivial example. You should probably close it once you are done with it, and maybe even validate that it exists before you do anything with it, but I just wanted to make this as simple to follow as I possibly can. This page contains an archive of all entries posted to Project in the Programming category. They are listed from oldest to newest. 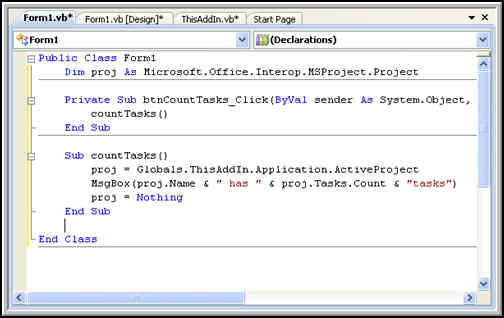 MS Project Tips is the previous category. Project 2007 is the next category.